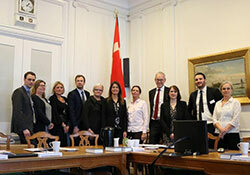 Dr Jill Farrington (third from right) addressed members of the Danish Parliament on World Hearing Day 2017. On World Hearing Day, 3 March 2017, Dr Jill Farrington, Coordinator, Noncommunicable Conditions at WHO/Europe, addressed members of the Danish Parliament regarding the need for public health action to make listening safe and reduce hearing impairment. WHO was invited to speak in Parliament at an event that included an innovative experiment: health spokespersons from three political parties agreed to go to work with an artificial hearing impairment. To gain first-hand experience of the challenges hearing loss imposes on everyday life, they were equipped with an earplug that reduced their hearing for a few hours, and were then connected to a hearing aid. They relayed their experience of a day at work with a hearing impairment back to the plenary with a clear understanding of the impact of hearing loss. “Even with partial hearing loss it was hard to concentrate and I felt completely drained of energy just after these few hours – I cannot imagine what it must be like to have this as a permanent condition and the isolation it must result in,” said Liselott Blixt, Chair of the Parliamentary Health Committee, Denmark. Dr Farrington outlined the scope of the problem, which has great costs for individuals and society but can be prevented, detected early and reduced by raising awareness on safe listening, combined with legislation. According to WHO global estimates, 15% of the world’s adults have some degree of hearing loss and nearly one third of adults aged over 65 years have hearing loss. WHO estimates that 50% of young people (aged 12–35 years) are at risk of hearing loss owing to their unsafe habits of listening to music through music players and at concerts, discos, bars and sporting events. The changing demographic profile, with an increase in older-age populations, is also resulting in a higher number of people with hearing impairments. Reduced hearing has far-reaching consequences: adults with hearing loss have a much higher unemployment rate, and those who are employed often earn lower wages compared with the general workforce and retire early. Exclusion from communication can have a significant impact on everyday life, causing feelings of loneliness, isolation and frustration. It is also associated with early cognitive decline in older people. Among people with severe hearing loss, the risk of dementia is five times higher, and the risk of depression is also increased. Even with a small hearing impairment, the risk of falls is three times higher. “Hearing loss represents a serious health and social problem. It reaches outside the health sector to span several of the Sustainable Development Goals (SDGs), affecting employment, access to education and inequality. This year’s World Hearing Day is a call to action for policy-makers to focus on the enormous social consequences hearing loss represents, but it is also an opportunity to recognize and seize gains if the necessary investments to solve the problem are made,” concluded Dr Farrington.